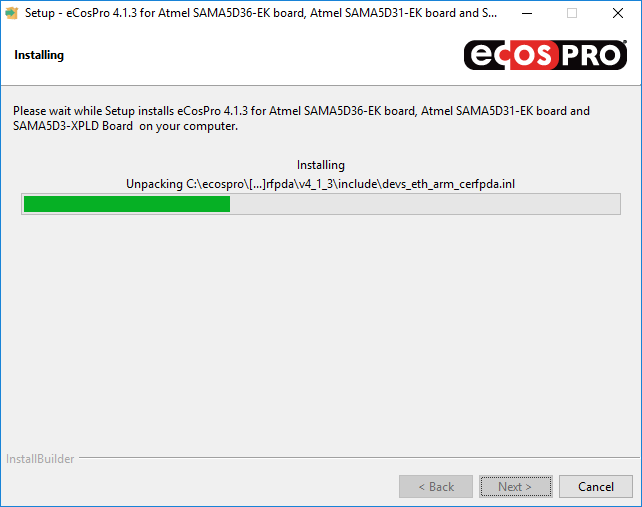 The eCosPro Developer's Kit installation process is essentially the same for both Linux and Windows. The screens displayed in this chapter, Chapter 4, Installation Walk-through, are primarily those encountered during a typical installation on Windows 10. The screens on other versions of Windows, as well as Linux distributions, will be very similar. This section assumes you have started the installer as described in either Section 3.1, “Installation on Linux” or Section 3.2, “Installation on Windows”. While root access on Linux is no longer a requirement, you must be logged on as Administrator or a user with Administrator privileges on Windows. 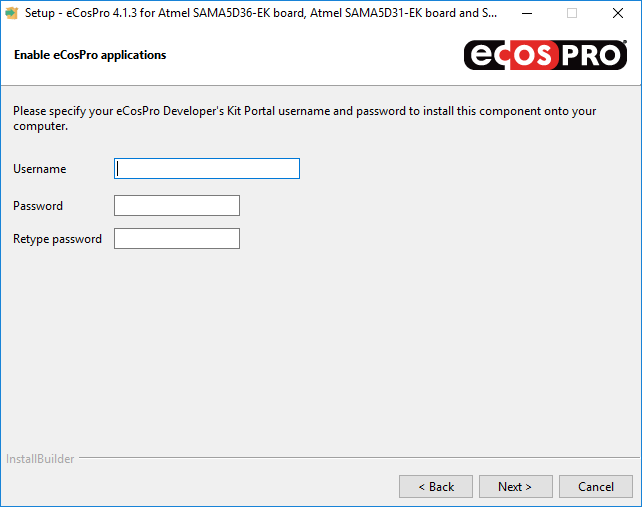 If the eCosPro Developer's Kit is already installed on the host, you will receive a warning pop-up and be asked if you wish to re-install, overwriting any previous installation. For further details of reinstalling components, please read Chapter 9, Reinstalling Components. 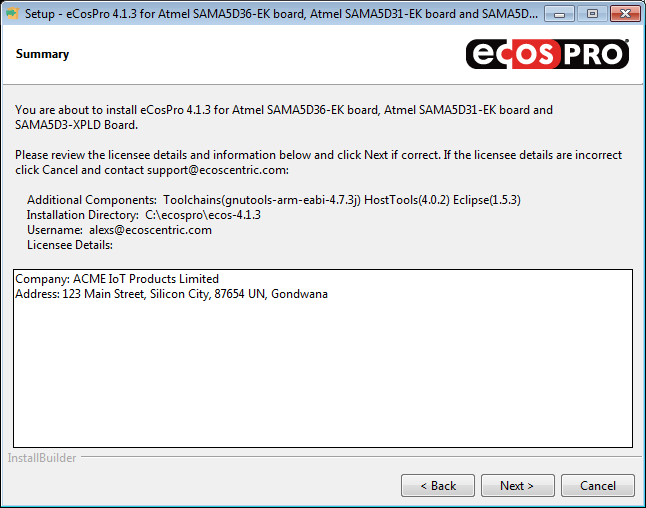 Figure 4.1, “eCosPro Installer Introduction Screen” illustrates the first window, the introduction window, of the eCosPro GUI install process. The software provided in the eCosPro Developer's Kit falls under a number of different licenses. 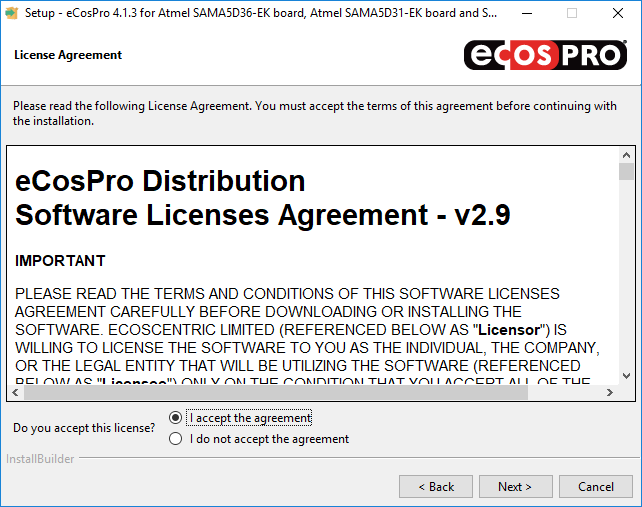 The dialog box illustrated in Figure 4.2, “License Agreement Screen” allows you to read these licenses, also available online at http://www.ecoscentric.com/licensing/ecospro-distribution-licenses.shtml. The installer will not allow you to continue with the installation until you agree to adhere and abide by all of the terms and conditions of all of the licenses. If you agree, select the option marked “I accept the agreement” and press “Next”. You will then proceed to the screen described in Section 4.3, “Select Components”. If you do not agree, select the option marked “I do not accept the agreement” and select “Next”. A pop-up will confirm you wish to exit the installation. This is also known as the primary installer as it allows the automated installation of the remaining components When optional components are selected in this installer, the corresponding installers are also executed. The default installion consists of all eCos and eCosPro sources and documentation, and components 2, 3 and 4 below. The default installation consists of all host binaries and documentation. The default installation consists of Eclipse CDT, the eCosPro CDT Plugin, and documentation. The component selection frame allows you to determine which components or items are to be installed and differs installer to installer. For example, the Host and GNU Tools installers have the source code as an optional item, not selected by default, with the binaries as a compulsory item. 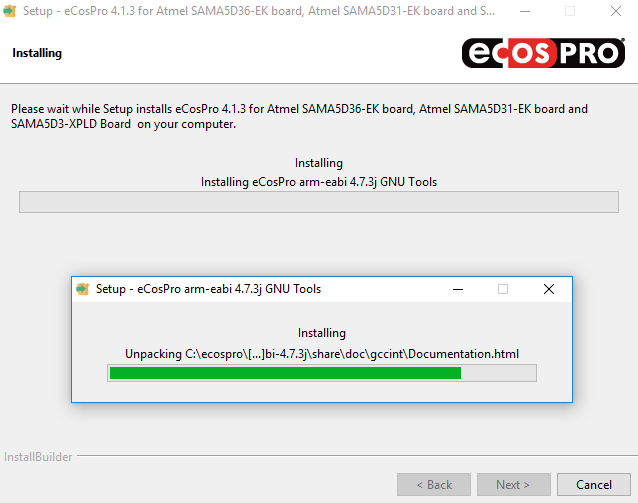 The Eclipse installer has the eCosPro Eclipse/CDT plugin as the compulsory item, with Eclipse as the optional item to allow you to install the eCosPro Eclipse/CDT plugin into a third-party version of Eclipse. Finally, the eCosPro release installer has the eCosPro release as the compulsory item, and lists all the former component's as optional items, selected by default for installation. By default the primary installer selects each component not already installed. If a component is already installed, or is unavailable, it will be delselected and made inactive. Normally you would leave all components selected as illustrated in Figure 4.3, “Select Components” and select “Next”. If you de-select a component, not all parts of the eCosPro developer's kit may function correctly. In this case you are advised to create your own development profile or environment, selecting your own eCosPro host tools, GNU Tools or Eclipse as you require. Please read the section on Profiles in the eCosPro User's Guide for further information on eCospro Profiles. The directory $HOME/ecospro. For example /home/alexs/ecospro. For example, eCosPro 4.1.3 will be installed into C:\eCosPro\ecos-4.1.3 on Windows and $HOME/ecospro/ecos-4.1.3 as a regular Linux user. 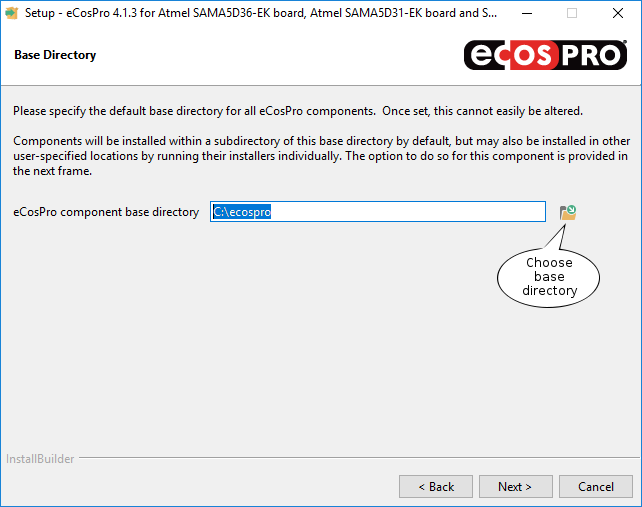 This frame, illustrated in Figure 4.4, “eCosPro component base directory screen”, allows you to select the base directory into which eCosPro components are to be installed by default. Once set, this is used as the parent directory for all subsequent automated eCosPro installations by the primary installer. You will not be shown this frame again. 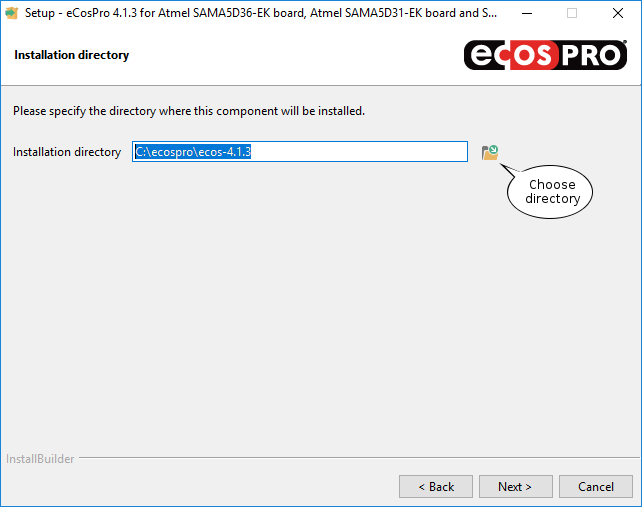 If you wish to choose a different location for the base directory, select the folder icon called out in Figure 4.4, “eCosPro component base directory screen” to create or browse to the base directory, or simply enter the path to the base directory in the field provided. Once you have selected or confirmed the base directory, press “Next” to select the installation directory for the curent component. Do not select an alternative location that contains spaces within any part of the path or the folder name. Spaces cause issues with the GNU Tools, in particular GNU make which uses spaces as separators and is used to build eCosPro and its applications. 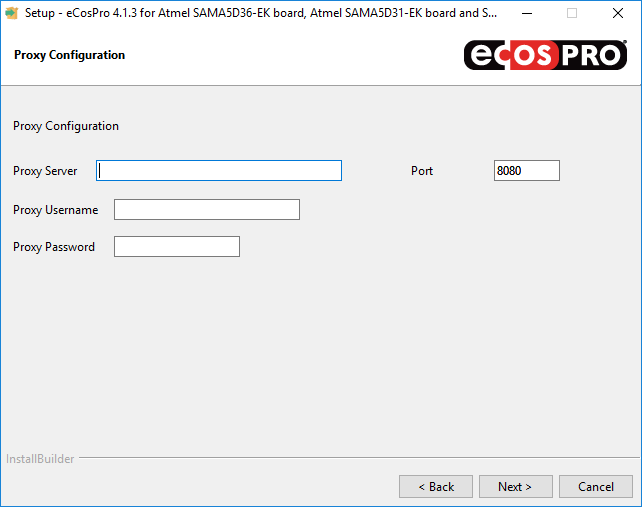 The next step of the installation process is to select where you wish to install the eCosPro component, as illustrated in Figure 4.5, “Installation Location Screen”. If you wish to install to a different location, select the folder icon called out in Figure 4.5, “Installation Location Screen” to create or browse to folder into which the component is to be installed, or simply enter the path to the installation directory in the field provided. Once you have selected or confirmed the installation folder, press “Next”. 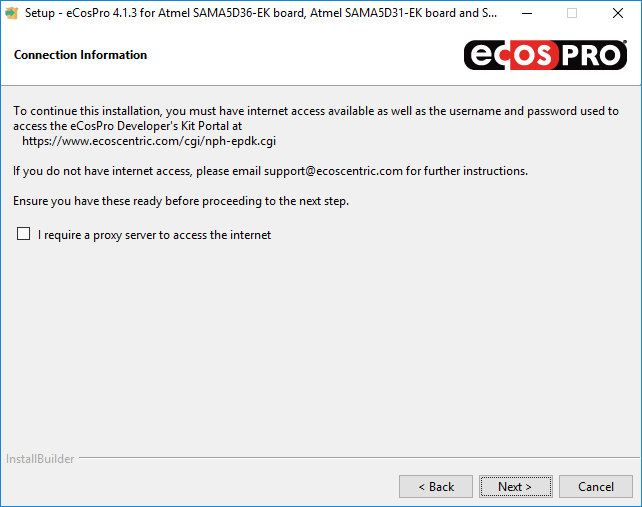 To continue the installation you must have internet access available as well as the username and password used to access the eCosPro developer's kit portal at https://www.ecoscentric.com/cgi/nph-epdk.cgi. Some corporations only permit access to the internet through proxy servers, some of which also require authentication. If you do not require the use of a proxy server, ensure the box illustrated in Figure 4.6, “Connection Information Screen” is not selected and press “Next”. If you require the use of a proxy server, check the box illustrated in Figure 4.6, “Connection Information Screen”, press “Next”, enter the proxy information as illustrated in Figure 4.7, “Proxy Configuration Screen”, and press “Next”. Provide the username and password used to access the eCosPro developer's kit portal, illustrated in Figure 4.8, “Connection Information Screen”. When complete, press “Next” for the installer to fetch the licenses applicable to you and to proceed to the next frame. If you are not licensed for an eCosPro component selected for installation, the installer will display an error message and exit. The summary page displays the components you have selected for installation, the installation location, as well as the licensee information. This includes the name and address of your company and any other details relevant to your license. Please review the information provided and click “Next” to proceed with the installation. If you do not satisfy the constraints, click on the Cancel button followed by the YES button of the following pop-up window in order to cancel the installation, and contact eCosCentric. The eCosPro installer will commence with the installation of the components selected as illustrated in Figure 4.10, “Component Installation Screen”. Do not close or interact with these pop-up windows. They will close when the command completes or the external component installer finishes. If an error occurs, such as the error illustrated in Figure 4.12, “Missing Java Error Dialog”, you will be prompted whether you wish to continue the installation, ignoring the error or failure, or whether you wish to cancel the installation. If you cancel the installation, components successfully installed by the primary installer will not be uninstalled. Only partial installations will be removed. While every attempt to avoid the use of shared libraries on Linux has been made through the static linking of libraries, the advance of Linux distributions has resulted in the change of format and location of shared files (for example, wxGTK 2.8.18, used by the eCos GUI Configuration tool, is the most commonly affected through its use of common icons). In the wxGTK example, the native shared library libpng12.so is used to prevent such problems arising. The Host Tools installer therefore runs basic checks to determine missing shared libraries and provide a warning dialog if any are detected. If run individually, the Host Tools installer will provide the user the opportunity to install the dependancy and re-test. Otherwise it will continue installation and warn the user towards the end of the installation of the missing shared library. Missing shared libraries must be installed for the tools to run: please use your native package manager to determine which package provides these shared libraries and install them. When the installation has completed, a frame such as the one illustrated in Figure 4.13, “Setup Complete Screen” is shown. At this point, if there are any documented notes or issues specific to this release, they will be contained in a README file which you can optionally display by selecting the checkbox, before selecting “Finish”. This file is also located at the root installation directory. The installer will terminate when the README window is closed. If the README is not selected, it will terminate immediately. The documentation index includes links to the documentation of the target platforms for which the eCosPro release was made. This documentation will describe how to set up your embedded hardware for eCosPro development and, if applicable, how to install RedBoot, GDB Stubs and how to debug your application using JTAG. Please ensure you read through this target platform documentation thoroughly. The source code to the Eclipse IDE is not provided. You do not need to install the source code for either the eCosPro Host Tools or the GNU Toolchains in order to develop and build eCosPro and eCosPro applications. They are only needed if you wish to re-build the host executables for the eCosPro Host Tools or GNU Toolchains. They may also be installed at a later stage by re-running the individual installer for the relevant component (see Chapter 9, Reinstalling Components). The eCosPro primary installer will not attempt to install a component if it has already been installed. It will not install the source code for the eCosPro Host Tools or the GNU Toolchains. The standard eCosPro support contracts provided by eCosCentric do not include support for rebuilding the host and GNU tools. The Eclipse instllation requires a Java Runtime Environment (JRE) with a minimum version on 1.8 to be installed on your host system in order to run. This must be installed prior to installing the eCosPro CDT plugin for Eclipse. The Eclipse installer will attempt to locate a JRE on the host system during installation. If it fails to find a suitable candidate, it terminate with an error as illustrated in Figure 4.12, “Missing Java Error Dialog”. By default, the standard Eclipse CDT installation for your host is installed by the installer, and the eCosPro CDT plugin for Eclipse installed within this installation using the Eclipse p2 installer. 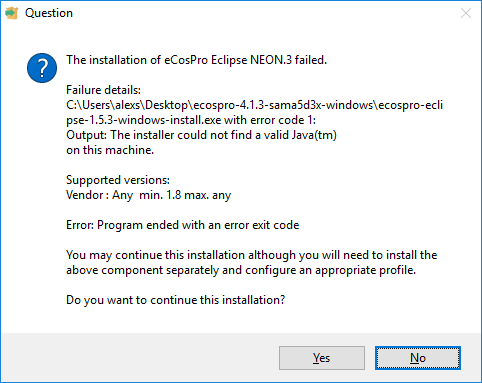 If you wish to install the eCosPro CDT plugin for Eclipse into a third-party or existing release of Eclipse, you must run the eCosPro Eclipse installer separately and deselect the Eclipse component. You will still be prompted for the location where Eclipse is to be installed - this is for the location of the accompanying documentation. However, when you progress to the next frame you will also be prompted to provide the path to the eclipse executable for the Eclipse installation into which the plugin is to be installed. The eCosPro CDT plugin for Eclipse installer will then invoke that installation's p2 installer to install the plugin. Eclipse does not attempt to check whether a JRE or a suitable JRE is installed following its installation. Eclipse will simply fail to start if no JRE is found or will terminate with an error if the first JRE found in its path is unsuitable. In general, we recommend installing eCosPro from within your graphical desktop environment (GNOME or KDE), but installation is also possible from a text-only console or remote shell, as illustrated in Figure 4.14, “eCosPro Linux Console Installation”. The installation steps are very similar to the graphical installation, with the primary installer spawning the installers of dependent components if they are not already installed. To perform a console installation, run the primary installer with the additional parameters --mode text. 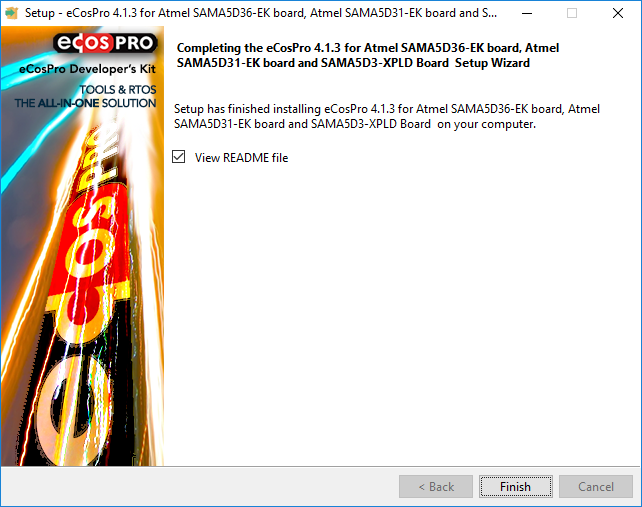 Component installers may also be individually executed if you are upgrading specific components of the eCosPro Developer's Kit. 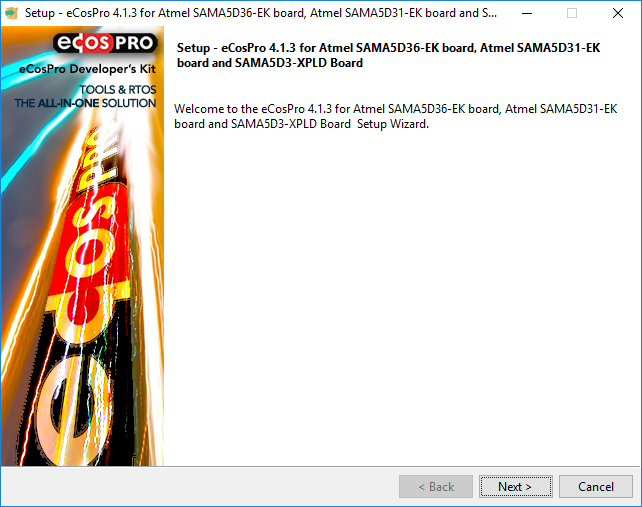 board and SAMA5D3-XPLD Board  Setup Wizard. The Console installation method is not available for Windows hosts. Advanced eCosPro users may wish to install eCosPro or its components individually. When doing so users must then set their own build environment to configure and build eCosPro and their applications. For example, the PATH environment variable must be set to include the bin directory of the GNU Toolchain at its installed location (e.g. /opt/ecospro/gnutools-arm-eabi-4.7.3j/bin or C:\eCosPro\gnutools-arm-eabi-4.7.3j\bin) as well as the bin directory of the eCos host tools at their installed location (e.g. /opt/ecospro/ecoshosttools-4.0.2/bin or C:\eCosPro\ecoshosttools-4.0.2\bin). They must also set the ECOS_REPOSITORY environment variable to point to the packages subdirectory of the eCosPro installation (e.g. /opt/ecospro/ecos-4.1.3/packages or C:\eCosPro\ecos-4.1.3\packages). For further information please see Chapter 6, Environment Variables.